2013 Installation for the Harwood Museum in Taos, New Mexico. In the fall of 2012 I was invited by the curator of the Harwood Museum to create an installation for the Curator’s Wall. 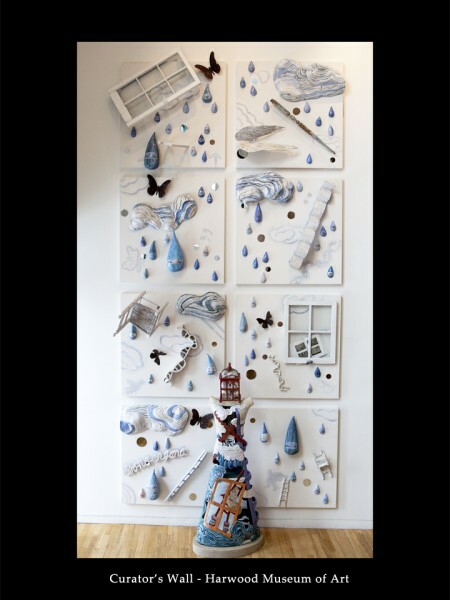 I spent the next six months creating Synecdoche, a ceramic and mixed media installation describing my creative process. Synecdoche means- the part represents the whole-in the way this piece represents the whole idea in all of its many parts. Two videos of the project are uploaded to this website. One of them is a time-lapsed video of the entire six months of creating the project, by Kathleen Brennan. The other is a video created by David and Beverly Schler. It explains the project and documents the installation at the museum.